Did you know that spices can have up to 50 times more antioxidants than your favorite fruit, making them powerhouses when it comes to anti-aging? Most of us think of spices as a food flavoring. Ayurveda considers them as medicine. One study published in the Journal of Medicinal Foods, for example, found that spices can significantly reduce blood sugar levels, a potent aid in warding off premature aging, heart disease, and diabetes. Think of it as Spice Therapy. It’s one of the genius gifts of Ayurveda: Optimizing health in a pinch! My love for Tulsi causes me to write today. Tulsi has been my tea of choice this week. When I woke up Monday morning feeling a sore throat coming on, it was to Tulsi I turned. When I inadvertently inhaled gas on Tuesday (from a restaurant’s open patio fire extinguished by the wind, which then scooped up the gas and swept it right into our lungs), Tulsi relieved the ensuing headache. When a reaction to new carpeting caused a slight asthma flare up, I sat down to a cup of Tulsi. I am talking like Tulsi is a person! In fact, Tulsi is a living being, a plant known as Holy Basil. Similar to the basil that so deliciously flavors Italian dishes, this basil is warm, slightly sweet and a bit peppery. It’s becoming a bit of a celebrity in the arena of women’s health as it reduces cortisol, that tricky hormone that when chronically elevated can cause aging, weight gain, sleeplessness, irritability, depression, and the list goes on. Organic India has built a successful global company on Tulsi and their organic teas are prolific these days. Look for them in your local healthy markets. Or, you can order online: Banyan Botanicals is now selling the divine Pukka teas with a Tulsi sampler, also selling Tulsi in an easy liquid extract and powdered. You know that people the world over turn to Ginger for stomach upset, but do you know why? According to my Ayurvedic mentor Dr. Suhas Kshirsagar, Ginger stimulates Agni, the inner fires that burn away toxins and any cause of upset. Warming, calming, balancing, Ginger also helps reduce anxiety, inflammation, asthma, congestion, cough, cramps. It is anti-inflammatory, anti-spasmodic and analgesic. One inch of fresh ginger in a cup of boiling water is the ideal accompaniment to your meals this season. You can also use 1/2 a teaspoon of ginger powder, which is in fact the better option if you are Pitta Dosha. 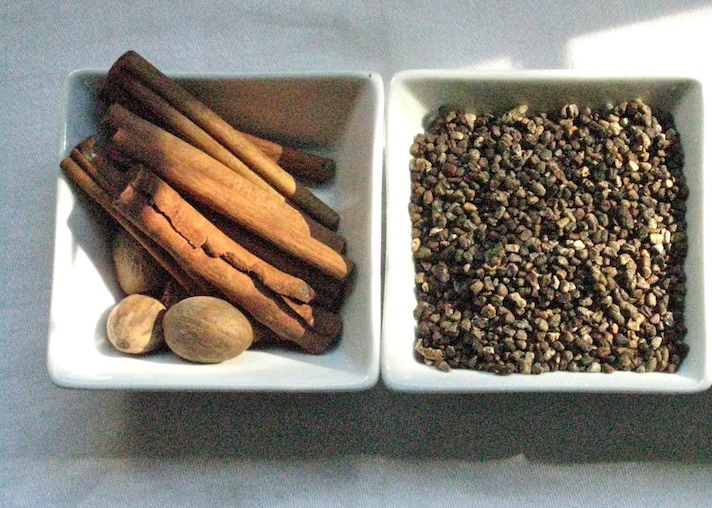 Light, dry and warm, cinnamon is one of the best digestive spices there is. No wonder it is added to so many sweet dishes! According to Dr. Deepak Chopra, “Cinnamon may help reduce chronic inflammation, which is linked to neurological disorders such as Alzheimer’s Disease, Parkinson’s Disease, Multiple Sclerosis and Meningitis.” It is also known to lower glucose and cholesterol, helpful again for heart disease and diabetes. Probably my favorite spice in any season, Cardamom is medicine for all three doshas (doshas are bio-energies you can learn about here). It decongests Kapha, regulates Vata and calms Pitta. Add it to coffee and it reduces the negative impacts of caffeine. Add it to any dessert and it helps reduce blood sugar. According to Vedic guru Dr. David Frawley, cardamom can help with nausea, vomiting, bloating, flatulence and acidity. According to Dosha Guru, “science is investigating its antioxidant, anti-cancer, anti-inflammatory, immunomodulatory, kidney and urinary disorders, gut modulatory, blood pressure lowering, diuretic, and sedative” actions. For all these reasons I love cardamom, but mostly I love those peppery little seeds as they tumble out of their ochre-lined, green pods. I love the way it is added to breakfast every morning in India so you start your day fragrantly. I love it in Chai, Chayvanprash and Rose Petal Lassi, and I love the way it smells in a home-made, seasonal Abhyanga oil. Cardamom is like a favorite perfume to me: redolent of all that is rich, tender and so dear. Remember when Grandma made you a cup of hot milk to help you sleep at night? Did she add Nutmeg? Nutmeg helps cut the heaviness of milk which is one way it helps you sleep – so you are not kept awake by a noisy, roiling digestive engine. More importantly, nutmeg has been found to have direct benefits to sleep by its calming, sedative effects, which is one reason it is such an key ingredient in this deep sleep tonic. Nutmeg is a nervine, and can be useful in treating skin, liver and bladder problems. According to Dr. Vasant Lad, nutmeg is a tonic for the brain and heart. Just don’t take too much. In the Autumn, when days are shorter and cooler, brewing a cup of tea is a simple way to enjoy the benefits of the spices in your pantry, while warming you to the core, and encouraging that necessary daily pause. Steep spices in gently boiling water for ten minutes. Strain and serve. This tea is great as is, but you can also add almond milk for a richer cup. For a deeply nourishing tonic, blend 1/2 cup of unsweetened almond milk with 2 dates. Add 1/2 cup of the hot spice tea. Stir, drink and watch your Vata melt into a puddle of Ojas. In addition to the Tulsi, you can order organic spices from Banyan Botanicals. What are your favorite autumn flavors, spices, and ways to renew? What I really want to know is how are you taking care of you this month? We are a community of herbalists dedicated to educating the public about the potent properties of plant based medicine - connecting us back to our roots, our mother earth. Hello Beloveds, Thanks for sharing! Your work is a deep and nourishing gift in our world. We are all blessed by you.